This is one of the hardest parts of our hair to keep in order and break-free. The whole hairline...not only the front but the back (the kitchen) as well. 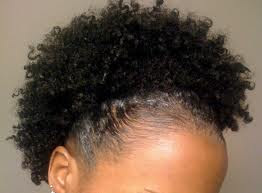 These areas are prone to breakage, because for most, this is the thinnest part of our hair. I ask, Are you protecting your hairline? Face wash, alcohol, make-up, etc: Yes, When we put these products on our faces, or wash them off. We tend to touch our sides, or the front of our hair. Sometimes residue is left, and not properly rinsed away. This can definitely cause breakage. Our skin and our scalp can not take the same treatment. Therefore, when you're washing your face with that alcohol pad, and you're touching your hairline...rinsing with water afterwards will be a great idea. This will help get any left over make-up, face wash cream, etc. off of your face and out of your hairline. Brushing: Many people put their favorite gel/product on their sides to accomplish that nice style for the day, and then they grab "the brush" that they've used for years and start brushing away. Doing this too often can definitely cause damage to the scalp. Try not to brush heavily and always use a brush with soft bristles. Braiding: If your sides aren't strong in the first place. Do not braid them tightly. Trust me! This is a huge no no. 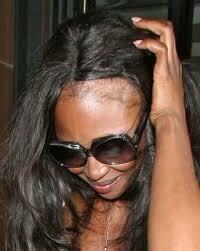 I've seen so many women who are now bald on their sides / edges due to this, so don't go this route. If you want the look, go for it, just try not to pull too tightly. Don't mess up your profile for a quick hairstyle! Ponytails: This tie into braiding too tightly. Longer hair naturals try to avoid those super tight ponytails. Whether they are towards the back of your head, top, or side...Loosen up! Literally. In reality looser ponytails are actually cuter anyway...in my opinion. Gives a more natural look, and that you're not trying too hard to show length. Chemicals: Speaking to the Naturals who dye their strands. Most of the time women worry more about the ends of their hair being dyed, wanting to be sure that the dye is throughout the hair. So worried that they do not rinse it out good enough. 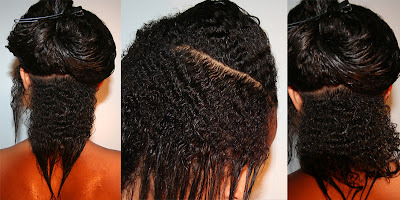 Not only can this cause damage later, but the edges are suffering, because when a runny product is put into the hair. It tends to run where? Down your face, down your neck. Towards your hairline. Therefore, these areas are becoming over processed! Rinse / Rinse / and Rinse again. Get it all out! I do not recommend hair dye, but if you're doing it, please be cautious. I hope these helped. My advise will be to Protect Your Hairline no matter what! Remember, It's one of the most important parts of your hair! Don't mess up your profile for a quick hairstyle!